Films of a certain nature achieve a literary quality; ones with a large cast of complex characters or with a sweeping narrative arc that transforms a main character to either a tragic or heroic end. Almost by default, a film like The Duel achieves this. Clumsily titled with the novel’s original author at the beginning, Anton Chekov’s The Duel is a film rich with complex character motivations and difficult psychological questions. If you are one of the presumably few who would enjoy a movie that falls under the category “Darwinian melodrama,” then boy are you in for a treat. For the rest (and most) of you, sadly, there is not much here outside a sometimes-stirring philosophical musing set against gorgeous scenery. The biggest strength of The Duel is that the director, Dover Koshashvili, infuses a filmmaker’s sensibility into the visuals. Period dramas are often stuffy and cramped, especially when they are adapted from plays. Thanks to cinematographer Paul Sarossy, the scenic shots here are gorgeous compositions, especially the use of moving water to enhance a frame’s beauty. This makes the movie feel like it is always moving toward something, crucial to a work so hefty with ideals. Chekov’s set-up is pretty basic, more of a gateway to those ideals than an engaging narrative. It has a hysterical aristocrat (Andrew Scott) mistreating his still-married mistress (Fiona Glasgott) and feuding with an arrogant scientist (Tobias Menzies). As you can tell from those descriptions, none of these people are meant to be likable. The duel that gives this story its title will not satisfy anyone hoping for a bloody reward to sitting through the proceedings. These characters are too obsessively written to adhere to any sort of predictability. Such meticulously written characters require performances worthy of them, and the ones by the three main actors are all decent, though no one really sticks out. Scott’s bursts of hysteria as Laevsky aren’t as convincing as they would be from a more experienced actor, but he still shows restraint to a character that is ripe for melodramatic exploitation. Glascott’s alabaster skin lends itself well to Koshashvili’s camera, who makes use of her beauty in a haunting shot of her staring directly at us from the water. She is a character who wants to love while her military husband is away at war, and is willing to do so with the disgusting Laevsky because apparently she sees some semblance of humanity. Sly humor lends itself to that romance, because though they are both considered members of the aristocracy, they are plagued by monetary problems. It’s all a part of the grand illusion, which gives way to the animalistic desires that these characters give in to. Menzies’ character, Von Koren, is the biggest key to the movie’s message. He is a zoologist who challenges the religious ideals present in the aristocracy and the military. Rather than being met with charges of heresy, though, he is well-respected, probably because he is wealthy. He tries his best to be civil with people like Laevsky, but this story is structured around him at his wits’ end. It’s a forced scenario of survival of the fittest, though Chekov amusingly sees it as a game of mouse and mouse. The Russian names of all these characters and the author may throw off many who listen to the dialogue and hear British accents. This is an English-language adaptation, even though prominent locations such as St. Petersburg and Moscow are referred to as if these people were actually Russian. It’s likely to throw even more people off, reducing the audience to mostly critics and people interested in Chekov’s work. Despite the built-in limitations, it might do audiences some good to see a movie like The Duel. In just over 90 minutes, it creates a rich world worthy of literary fiction. It may stumble over its ambitions slightly, but Koshashvili has made a movie out of literature by using visuals to explain much of the story instead of just holding the camera in place while characters recite dialogue from the book. In other words, he’s filmed a movie instead of filming a book. 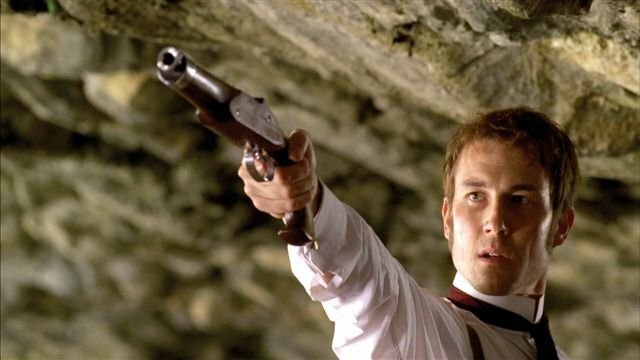 This entry was posted in Reviews and tagged Adaptations, Andrew Scott, Anton Chekov, Beautiful cinematography, Best Films of 2010, Charles Darwin, Darwin, Dover Koshashvili, Fiona Glascott, Great Cinematography, Russian literature, The Duel, Tobias Menzies by matterspamer. Bookmark the permalink. — Quite snotty and not helpful at all. He was at pains, however, to withhold all praise from something so well done. It had to be wrung from him, and often it was given rather mean-spiritedly. In truth,. this movie was actually terrific; a realistic adaptation of a challenging story and totally involving. The acting was understated and excellent as well. I’d dismiss the labored put-downs here and believe the praise. There are far too few works of such quality around. It’s much easier to praise a low-budget movie than a Hollywood one among critics. That’s why there is such a big disconnect between modern day critics and audiences, who lavish movies like Transformers 3 with box office glory even as Michael Bay is taken to critical slaughter yet again. Sure you could make the argument that if a movie like The Duel had a marketing budget upwards of 100 million that more people would see it. The truth is, though, many mainstream audiences see movies as purely an entertainment, and this movie denies it in favor of philosophy, which I personally had no problem with but I think many would. If you actually believe this adaptation is a masterpiece, that’s fine, but don’t pretend for a second that everyone would enjoy it. I encouraged people to see it at the end of the review, but you have to realize while watching it that a movie like this has a built-in limited appeal.